When the widowed Miranda Tyrell escapes a dire situation in Kent by accepting a position as governess in Lincolnshire, taking her young son with her, she never dreams she is jumping out of the frying pan into the fire. Instead of peace and safety, Miranda discovers the flat agricultural plains and salt marshes are rife with tales of mysterious fires, gutted animals, strange sights and sounds in the night. Her new charge is a disturbed nine-year-old known as the Demon Child. In addition, rumors supported by the local curate claim that her employer, a badly scarred veteran of the Napoleonic Wars, is a demon. And those are only the beginnings of her troubles as she attempts to teach two fatherless boys and deal with her wayward heart, which she swore would never love again. 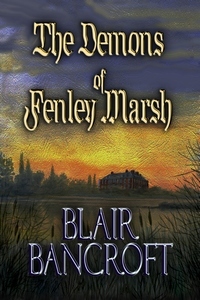 Note from Blair: The Demons of Fenley Marsh is a Gothic novel in the tradition of Victoria Holt, Mary Stewart, Phyllis Whitney, and my previous Regency Gothics, Brides of Falconfell and The Mists of Moorhead Manor. Although I try to create heroines who are intelligent and courageous, they also have flaws just like the rest of us, particularly Miranda, the heroine of The Demons of Fenley Marsh. I hope you'll like her anyway.